Spanish Worksheets to learn the difference between Diphthong and Hiatus and their correct pronunciation. Ejercicios para practicar la diferencia entre diptongo e Hiato en español. Spanish Worksheets to learn the difference between Diphthong and Hiatus in Spanish (Diptongo e Hiato). This refers to the way of pronouncing two vowels together in words. Sometimes as one syllable (diptongo), sometimes as two separate syllables (hiato). NOTE: This topic is usually taught in 3rd and 4th grade in Spanish-speaking countries. We teach this in Chile at that age though if your students are not in a Spanish-speaking environment or classroom, then I recommend using these worksheets at a much higher grade as the vocabulary will most likely be difficult for them. Chart: This contains the main rules and differences between Diptongo and Hiato. We look at ways of combining and pronouncing closed vowels (vocales cerradas) and open vowels (vocales abiertas) together. This includes examples of each case. Worksheet 1: The first worksheet looks exclusively at Diptongos. There are three simple activities. The first activity has 8 words and students need to color the words that contain a diphthong. The second activity has 4 words in Spanish that have the diptongo part removed it. For example: f__nte. Students need to draw a line from the correct diptongo that is missing and then write that complete word in the space that appears after the arrow. The final activity has four sentences in Spanish. Students need to underline all words in the sentences that contain a diptongo. Worksheet 2: This worksheets has the same exercises and activities as the first worksheet, though looks exclusively at Hiatos in Spanish. Worksheet 3: The first activity contains an acróstico in Spanish. In each line there is a word that contains either a Diptongo or a Hiato. Students need to underline the word and put an X in the corresponding box. Students then need to write the hidden word in the acróstico. The final activity has students writing the words they have underlined in the acróstico and then separate each word into its corresponding syllables. Worksheet 4: The first activity is to draw a line from the Spanish words to the appropriate box that says diptongo or hiato. The second activity is the circle the diphthongs blue and hiatus red that they find in four sentences. Worksheet 5: There are 8 words. Students need to divide each word into its appropriate syllables. Then they need to color each word depending on whether a diphthong (blue) or hiatus (red) that they find in four sentences. 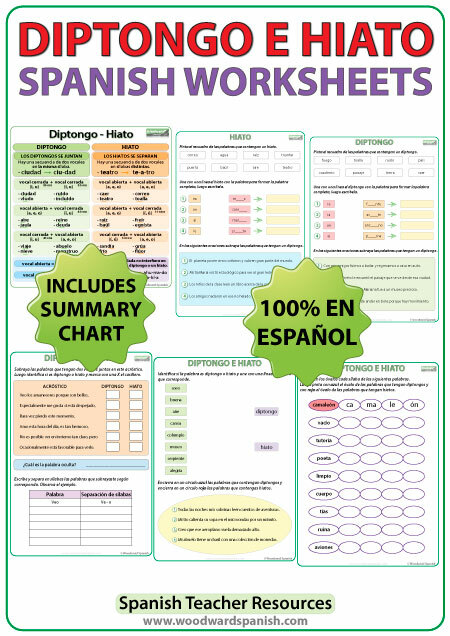 IMPORTANT: All of the worksheets, including instructions, are 100% in Spanish. An answer sheet has been included so that students can check their own work if this resource is used as part of a literary center. 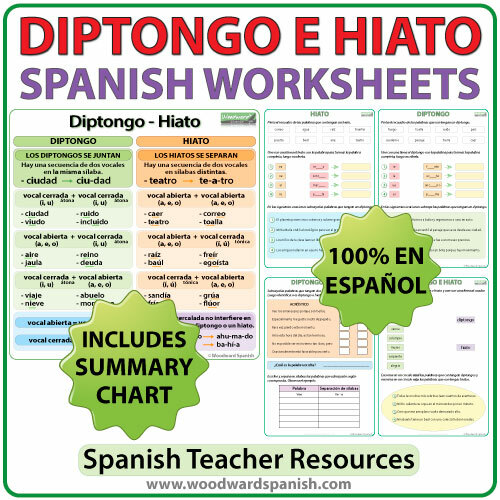 Be the first to review “Diptongo e Hiato – Spanish Worksheets” Click here to cancel reply.